Go direct to Microsoft's page Buy at $589.00 Load on 1 PC only and forever!!! 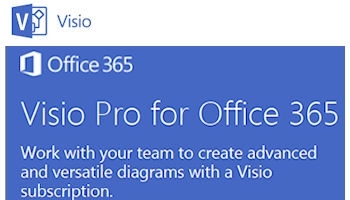 Experience Visio Pro on your PC, Mac, Windows tablet, and other select devices. This trial invitation has been customized for you by 5THNK.COM. Sign in to take advantage of this invitation. Order estimate This purchase offer has been customized for you by 5THNK.COM. Microsoft Visio Pro for Office 365, available as a subscription through Microsoft Office 365, includes the same features, stencils, and shapes as Visio Professional 2013. In addition, it allows each user to install Visio on up to five PCs running Windows 7 or Windows 8. It also adds Visio On Demand, which lets users temporarily install Visio on any PC running Windows 7 or Windows 8, and it automatically installs the latest updates (both feature and security) for the duration of the subscription. Get users up and running quickly with application streaming technology. Simplify your deployments by having the latest patches and updates installed automatically (with the option to delay installations using a centralized policy to allow for compatibility testing where necessary). Enable users to work from the computer of their choice with the option to install Visio on multiple PCs and even temporarily install Visio on kiosk computers while they’re travelling. Benefit from integration with other Office 365 services, such as presence and instant messaging (IM) integration through Microsoft Lync and Lync Online and the option to save and share your diagrams to SharePoint Online. Create and customize professional-looking diagrams using a rich set of expanded and improved effects and themes that apply a completely different look to your design in just one or two clicks. Create, review, and edit diagrams on Windows 8 tablets using touch, with improved support for common activities (such as adding and removing shapes) and gestures (such as pinch to zoom). Get to frequently used tools right away with a significantly improved quick-access floating toolbar. Easily replace any shape (or combination of shapes) in a diagram while preserving your shape connections, shape metadata, and overall layout. Easily give your diagrams the look you want with improved alignment, spacing, and sizing guides and new ways to adjust the appearance of your shapes (such as with drag handles). Use a simple wizard to create your org chart and import data from Microsoft Excel, Microsoft Exchange, or Microsoft Office 365. Quickly change the look of your org chart by applying one of several styles—from professional to playful—with just one click. Fine tune the way your org chart looks with improved layout options and a new ribbon tab that provides access to simple yet powerful controls. Streamline teamwork and reduce the risk of errors by allowing two or more people to work on the same diagram in a single file at the same time—from rearranging and adding shapes, to writing comments, to applying effects. With just one working file, you avoid the need to email files around, figure out what changes others have made to the original diagram, and manually merge multiple versions together. Get visual indicators of what shapes others are working on and easily sync diagrams when saving. Make it instantly clear which part of the diagram a comment relates to by adding comments that are connected to a specific shape and that will move with the underlying shape (including across pages). Simplify how you manage feedback by responding to comments directly, deleting individual comments if they no longer apply, or filtering comments based on criteria that you set, such as by author or page. Link to data from several popular structured data sources, including Microsoft Excel, Microsoft Excel Services, Microsoft SQL Server, Microsoft SQL Azure, and Microsoft SharePoint Lists and Business Connectivity Services. Get an always-up-to-date view of your data by keeping your diagram connected to the data source, so your shape formatting will automatically update to reflect any changes in the underlying data. Avoid having to save your diagram as a PDF or XPS document or having to paste it into a Microsoft PowerPoint presentation just to share it with others. Share your diagrams with your colleagues, partners, or customers—whether they are working from a Windows-based PC or on virtually any other device, even if they don’t have Visio installed. Provide a rich browser-based experience, with full detail from the original diagram, refreshable data (in diagrams with data links), the option to view and add comments, and improved touch support so you can view and interact with the diagram through virtually any device. Create live dashboards using data-linked diagrams. Create diagrams based on the BPMN 2.0 standard—today’s standard for business process modeling—and use the built-in validation rules to help ensure that your diagrams comply with the specification. You can also continue to open and update diagrams that use BPMN 1.2. Make it easy for diagram authors to check that their diagrams comply with your own business requirements by extending the validation engine to document your business rules. Use Visio to create visual Microsoft Project workflows for demand management, which work with both Microsoft Project Server 2013and Microsoft Project Online. F We at 5thNK do this every day!